Petr Bambousek | Wildlife Photography | Behind the Lens – Borneo II. Behind the Lens - Borneo II. Behind the Lens – Borneo II. Mantises are amazing bugs and before my departure to Borneo I would study and photograph them in studio conditions in case I’d happen to meet one. To my delight, this actually came true. Next to our lodge I happened to discover a newly hatched one that was freshly out of her skin, which was lying a few centimetres away from her. I knew instantly how to shoot her but there was a catch. I needed to stage a miniature studio. I asked my wife to find an interesting curly twig whilst I headed for a leaf of heliconia, which I eyed earlier in case of this situation. 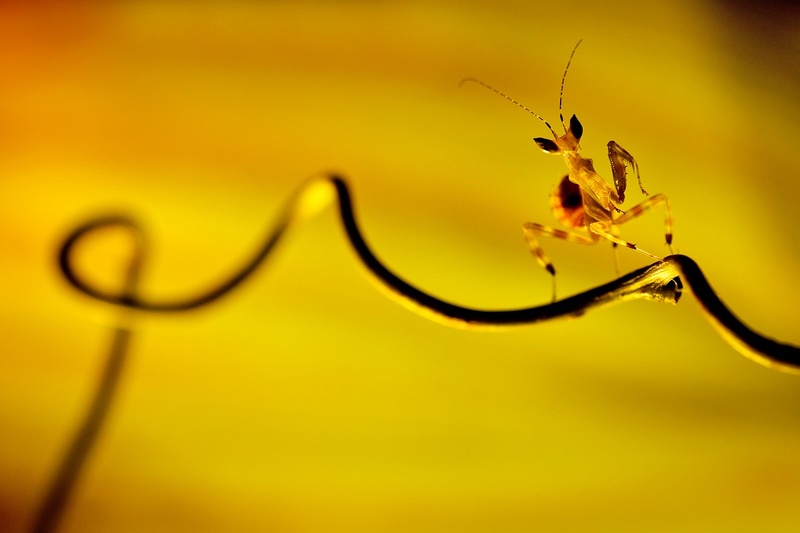 The mantis was really tiny, barely 10mm. I aimed for a dramatic setting and when I was finished with my arrangements I carefully transferred her to a stick and let her to walk about. After a while, she calmed down and started to parade back and forth. I took at least 100 shots before I was content with the result that looked exactly like I had imagined it when I found her. After this photoshoot I put her back to where I found her and she’d sped off to found something to eat. Before I went to bed I’d transferred my images to my PC and discovered a terrible thing – none of the photos was perfectly sharp. I broke out in a cold sweat even though I was already sweating as if in a sauna. All was to no avail! Reconciled, I went to sleep. The next day, after a full day of different activities we’d rest down exhausted in front of our lodge when my wife says: “Look, she came back to have a look at us”. That little creature was standing on a leg of my chair I was sitting on. I was totally speechless. We fired off into looking for an interesting looking twig and a heliconia leaf perfect for yet another impromptu mini studio. I took a lot less images and this time, I made sure on the spot that every image is perfectly sharp. I thanked the mantis and put her back into the wild a bit further away from the lodge. To this day I have no idea how this miracle came to be and I sincerely wholeheartedly thank the One who made it possible. During our stay, the lodge was flush-flooded several times, which would thwart all our photographing efforts. Apart from a personal baby mantis, whose story I described earlier, we also had a personal leech. This can actually be quite advantageous. Just as one puts a cracker under a door mat to find out if anyone visited his house at night, we had a sleeping leech that patiently withstood all the downpours and waited for us to leave for an outing to come with us. 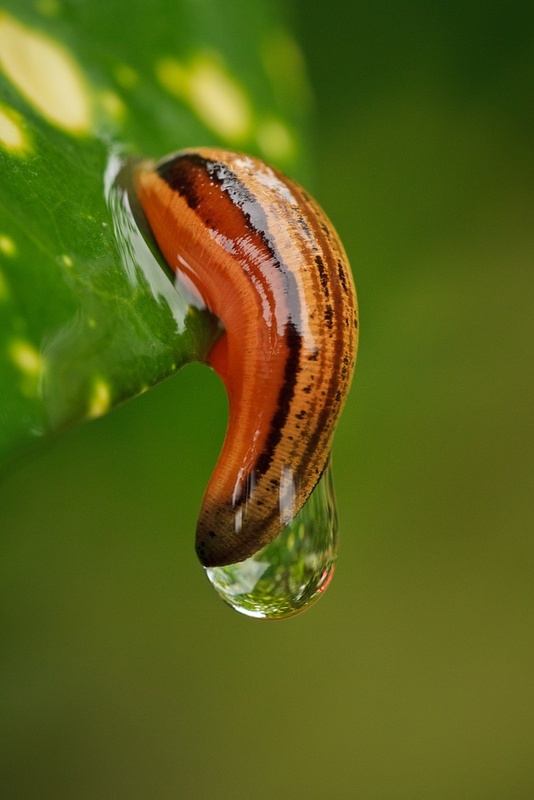 Luckily, leeches don’t transmit any infectious diseases. They just wait to be transmitted with the elected ones having the most sweet-smelling blood. When there is even the smallest sign of host coming, the placid looking “animal dropping” stretches and intensively quadruples its size. By looping movements it quickly embarks into a moving dining car. Unnoticed, it is capable of jumping from a tree onto a unexpected passing-by transport and so every now and then when walking through a rainforests of Borneo you just end up being a taxi for a while. A blood sucking leach secretes an anticoagulant enzyme that may cause a wound, once the leach is removed (if you actually succeed) to bleed more than normal. That is a sign that a leech-taxi is in the station and all of them soon know it. And so, whilst you may be getting rid of one, many others totally out of breath sprint through a forest trying not to miss their lift. There are many different recommended ways of getting rid of them but I will mention one. If you spray it with a DEET insect repellent you can just flick her off after a few seconds. I even felt a bit disappointed that it seemed that the leeches were avoiding me. Almost everyone from our group flicked off at least one, but not me. In the end, even I was successful and I had to reach out for a DEET and flicked. That I would never do though to our personal leech. Instead I immortalised it in its resting moment. Even in my wildest dreams I would never have imagined that during our few days on Borneo it’s possible to see that many hornbills. However, when I say ‘see’, I don’t necessarily mean ‘have an opportunity to photograph them’. All in all, I had three mere chances to shoot them; … about that some other time, though. 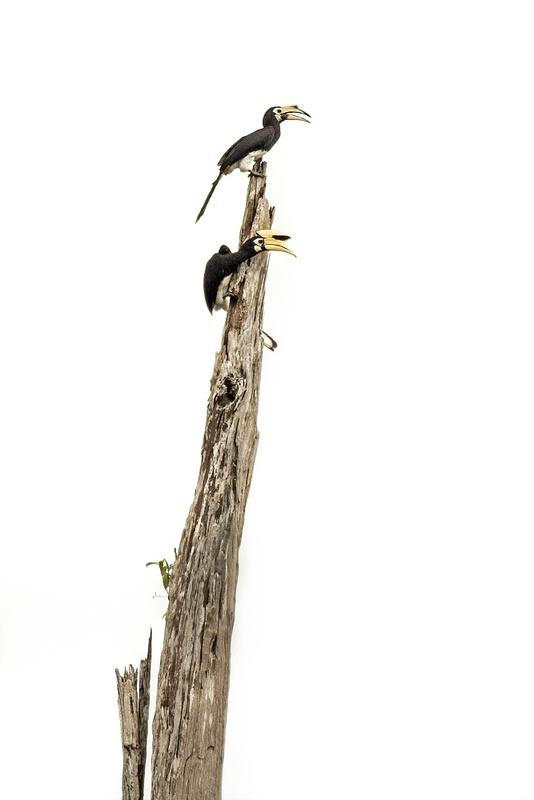 The photograph below of a pair of oriental pied hornbills is not what I expected or planned for however, I’m still quite pleased with it. As I previously implied, it rained a lot. And when it didn’t rain, it was miserably overcast and the weather resembled a dreary wintery day only with 25°C more. I was looking at a lonely tree stub reminding me what was once an abundant rainforest with animals, birds and insects of all kinds. Now, the countryside comprised of a few smallish fields and banana plantations dotted by a handful of hamlets. Despite apparent desolation, there was life, though. When I looked long enough into never drying puddles I could see a number of flies and dragonflies that were sporadically interrupted by a typical hornbill shriek. At first, I didn’t even bother photographing them. After a while though, I found something appealing in the simplicity of the whole premise. For me, it kind of represents hope that even when all the vegetation is gone, there can be life again.